YI is to the world of action cameras, what Xiaomi to mobile. In fact, YI is a spinoff of Xiaomi. 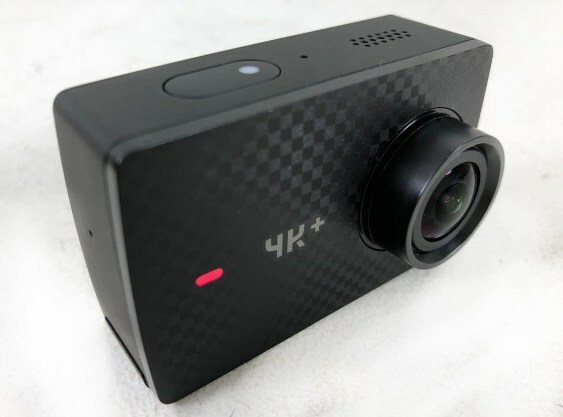 With these credentials it is enough to say that the new YI 4K+ is the direct competition of the GoPro Hero, offering similar benefits at a much tighter price. So let’s start with the price: 299 euros. It is not the cheapest but it has an extraordinary quality/price ratio. It is one of the few that is capable of recording 4K video at a speed of 60 fps (twice the normal one) and maintains a wide-angle lens with a coverage of 155º and a luminosity f/2.6 (perhaps its weakest point). The sensor is Sony Exmor R of 12 Mpx that offers good results in most situations. Only low-light scenes can be a problem. The videos are more than adequate. They offer a great sharpness and their peculiar angle of vision provides an extra attraction if you know how to take advantage of a singular point of view. It is important to keep the front lens clean of water and dust, in order to take full advantage of the sharpness and color that the camera can offer. The YI 4K+ records video in various resolutions, in addition to creating TimeLapse, and capturing photos and pictures in burst. Many of these functions are controllable by voice command. A feature that premiered GoPro and that seems useful in those situations or sports where the hands are busy. Of course, you can also control it through the top button and set it on the colorful 2.2 inch touch screen. By the way, one of the details that we like is that it incorporates a universal metal thread in the base, thanks to which you can add various accessories such as anchors or tripods. It has a USB-C connection that serves to recharge, such as micro input, monitor output and connection to the PC. The battery, as is common in these devices is small and limited capacity. It serves to ensure more than one hour of recording, but it is always advisable to have a spare.